2014 vinyl LP pressing reissue of The Animals' greatest hits collection covering the 1964-1965 period. Pressed on 180 G clear vinyl as part of ABKCO's Clearly Classic Vinyl Series, showcasing The Animals' tough-edged rock hits combined with their more devoted blues and R&B workouts. Produced by legendary producer, Mickie Most with the original line up of Eric Burdon, Hilton Valentine, Chas Chandler, Alan Price & John Steel. Includes two songs with Dave Rowberry on keyboards. Features their hits House of the Rising Sun & We Gotta Get Out of This Place both listed in Rolling Stone magazine's 500 Greatest Songs of All Time list & the Rock and Roll Hall of Fame's 500 Songs that Shaped Rock and Roll. "To me, The Animals were a revelation. They were the first records with full-blown class consciousness that I'd ever heard" - Bruce Springsteen. British blues rock band formed in the early 1960's. 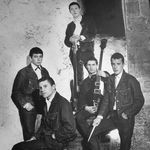 For releases by Eric Burdon & The (New) Animals (1966–1969), see Eric Burdon & The Animals. Inducted into Rock And Roll Hall of Fame in 1994 (Performer).